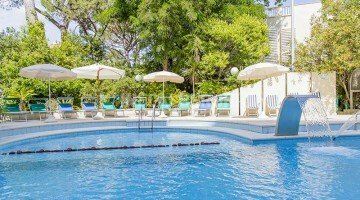 Hotel Vienna Touring , 4 star hotel in Riccione, is located near the sea and offers its guests a beautiful garden with heated swimming pool and paddling pool, free parking, disabled facilities and families, and a modular conference room. Pets up to 10 kg are allowed on request. The hotel is a short walk from the beach and less than a 10-minute walk from Viale Ceccarini. The rooms are equipped with satellite TV, safe, direct dial telephone, minibar, hairdryer. COMFORT: with balcony and classic decor. EXECUTIVE: with renewed furnishings, side sea view or swimming pool. SUPERIOR: spacious and welcoming, with large balconies overlooking the sea. SUITES: ample solutions, with a seating corner. Garden, heated swimming pool, open-air porch, free use of bicycles, hall, restaurant, elevator, american bar, reading room, conference room, beach towel for free use, weekly parties with live music, laundry service on request. PARKING: uncovered and free, available on request. CONVENTIONS: beach, amusement parks, discos, spas. On request: shuttle service, organized excursions. SERVICES FOR DISABLED: entrance on the ground floor with sloping ramp (Viale Gramsci side), rooms with wheelchair maneuvering space. PETS: allowed on request (max 10 kg). BREAKFAST: sweet and savory buffet, set up on the open-air porch. LUNCH AND DINNER: à la carte restaurant with meat and fish menu of the best tradition of Romagna. Pasta and desserts are homemade. VARIATIONS: vegan corner for breakfast, vegetarian cuisine and for celiacs on request. In the hotel: children's pool, outdoor playground area. On request: baby sitter and pediatrician. On the beach: playground, beach volleyball court and table football, ping-pong. The pool is located in the garden, is heated and has a depth of 72 to 135 cm. It is surrounded by a sunbathing area and flanked by a heated children's pool with 72 cm deep water. The hotel has a modular conference room for 150/200 people, equipped with stage, screen, video projector, amplification systems, flip chart. The affiliated establishment n. 63 has a playground, a beach volleyball court and 5-a-side football pitch, bicycles, a ping-pong table. 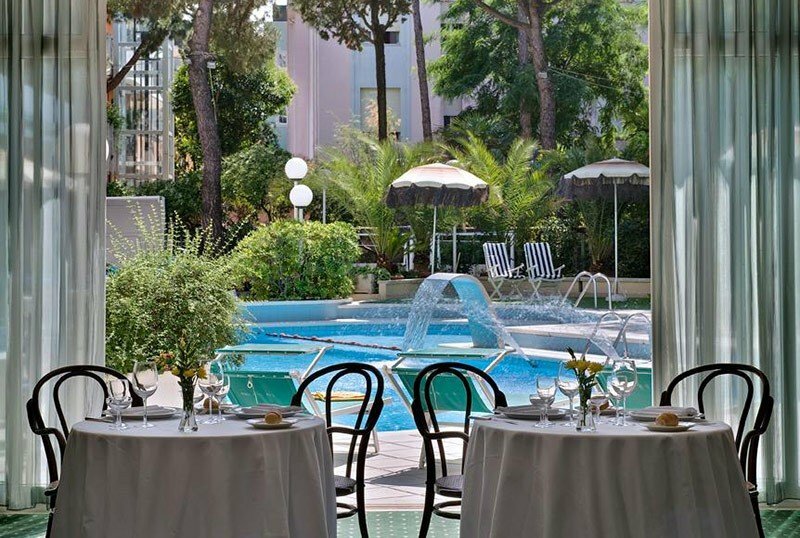 A pleasant moment of relaxation immersed in the greenery and quiet of its elegant garden, a stone's throw from Viale Ceccarini and the Riccione Spa. 2-day package starting from Euro 200.00 in a double room (2 people). Let yourself be pampered by a weekend at the sea! Its central location near the beach will give you moments of pure relaxation. National Swimming Championship AICS 2019 Riccione or weekend at the sea?